Sometimes you find yourself procrastinating over a large purchase for the home. Then within a few weeks of having taken the plunge you find yourself asking why on earth did I not do it sooner. That is how it was for me with my adjustable bed. I dithered about buying it, now of course I would not have any other type of bed. The benefits for me as someone who has scoliosis (curvature) of the spine has been significant. I am able to adjust the top and lower ends of the bed, to support my back and legs. This makes sleeping, reading, enjoying my morning cuppa far more comfortable and relaxing. The adjustable bed really comes into its own when I have a chest infection, usually for a period of 6-8 weeks I can not sleep lying down as this has an effect on my breathing. 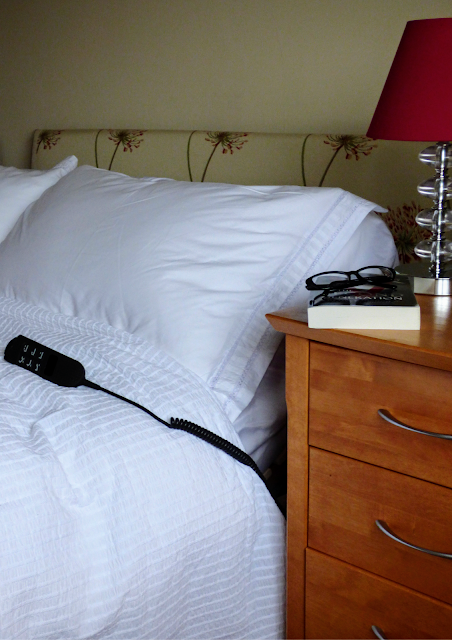 Using the adjustable bed during this period allows me to rest and have a supported and comfortable sleep. As such it is also good when you have a congested head cold, supporting you in a slight elevated position to allow congestion to drain away. Having had several knee surgeries there are times when my right knee is inflamed and swollen. I can pop upstairs and watch my favourite TV program on bed with the bottom of the bed elevated and my knee supported. Other days, when I am just too tired to sit comfortably on the sofa, I can be found crocheting, reading or watching TV on my bed - comfortably supported. 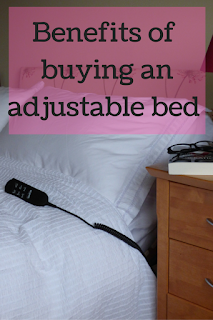 I can even be found blogging in bed, well why not some days you should make full use of an adjustable bed and your laptop. Nothing beats a morning cup of tea as you sit up supported in a comfortable position. Comfortable nights sleep - great for supporting your back and legs in the most suitable position for you. Been on your feet all day or over done things and have tired heavy legs. Grab yourself a cup or tea or a book and have half an hour on the bed with your legs elevated up. All at the press of a button. A know someone who suffers from silent re flux and as it is not recommend to lie flat currently has (no laughing), the complete works of William Shakespeare elevating the top of the bed slightly. Would this not be so much easier with an adjustable bed. Struggle getting out of bed in a morning, that's physically not because you are a lazy bones! Using an adjustable bed can help sit you up in a morning so you are positioned more comfortably for getting up. It is so easy to adjust the top and bottom of the bed using the electric controls. Mine clip to the side of the bed or onto the handle of my bed side table. Easily within reach day or night. Adjustable beds come with a variety of options, single, double, king size, different mattress types, even built in massage. 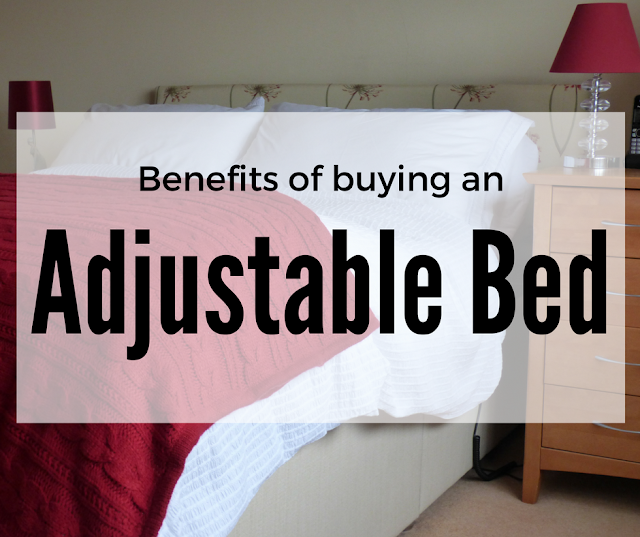 One supplier being adjustablebeds.co.uk who manufacture their beds in Britain. You can choose one complete double bed with one adjustable mattress, or a double with two separate mattresses allowing for both people to adjust their half of the bed to their choosing. 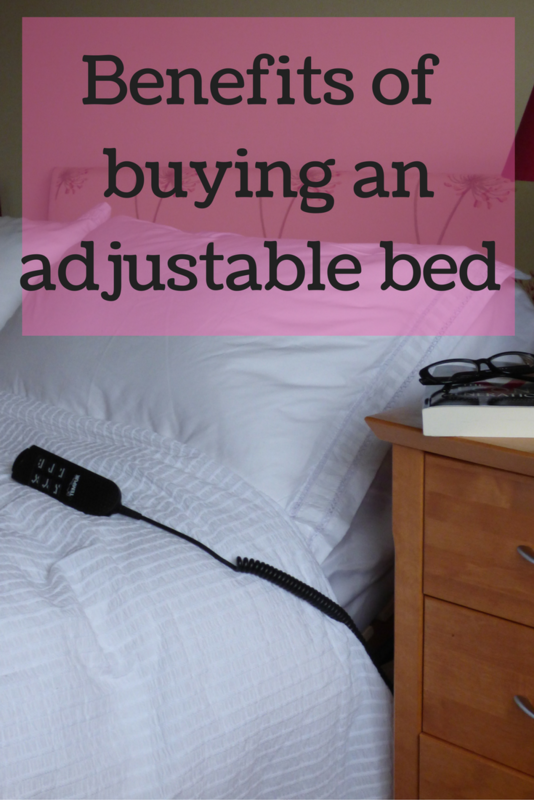 Have you ever considered buying an adjustable bed?